When you first create your book, you will need to set the language of your book. This language can be modified at any time after your book has been created, by going to the Book Info page. The Language setting changes metadata in your ebook, which can aid in placement in ebookstores. By default, the setting also changes the user interface language of the book’s admin interface. To set a different language for your user interfaces, see the section below. We are always looking to expand our language offerings, so if the language you wish to use isn’t available, you can email us the translated versions of the three words listed above at support@pressbooks.com and we will add them to the list. By default, your book admin user interface language will be the same as the language you selected for your book. Click on your name in the top right corner of your screen to open your user profile. NOTE: This setting is personal to you. It will be applied for all the books you work on, but won’t affect anyone else working on the same book as you. Every user can set their own language as best suits them. Our goal is to offer the Pressbooks interface in as many languages as possible, and we use a crowd-sourced translation tool to expand our offerings. This service allows anyone to log in and translate as many or as few words as they want, to contribute to the completion of a language project, which then becomes an option for all Pressbooks users. If you think you can help, go to our Transifex page and see if your language needs work. If your book includes text in a language that uses a non-Latin alphabet, Pressbooks allows you to embed additional fonts in your exported files to ensure it displays correctly. 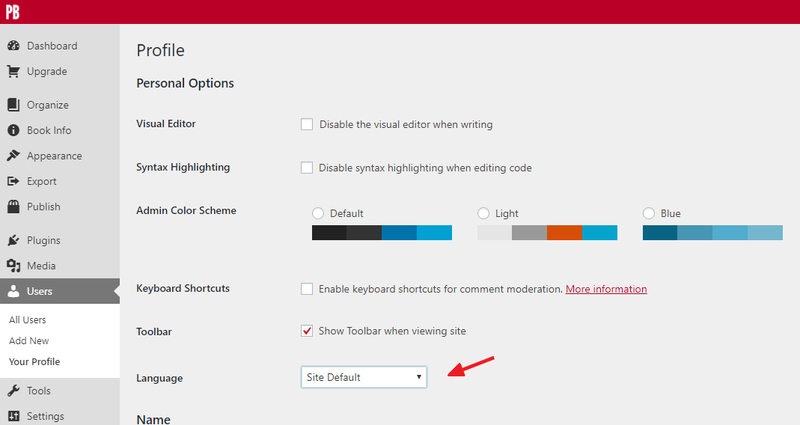 To do this, go to your “Theme Options” page and select the required language(s) under the “Language & Script Support” option. Many of these options have come in response to users’ specific needs, so if you would like to work in a language that isn’t currently supported, let us know and we will try our best to add it to the list. Email us at support@pressbooks.com. Note: since adding extra language scripts may greatly increase the file size of your exports, Pressbooks will not include Chinese, Japanese or Korean scripts in the EPUB and MOBI files, as these fonts are most likely already installed on your users’ reading devices. Languages by admin is licensed under a Creative Commons Attribution 4.0 International License, except where otherwise noted.